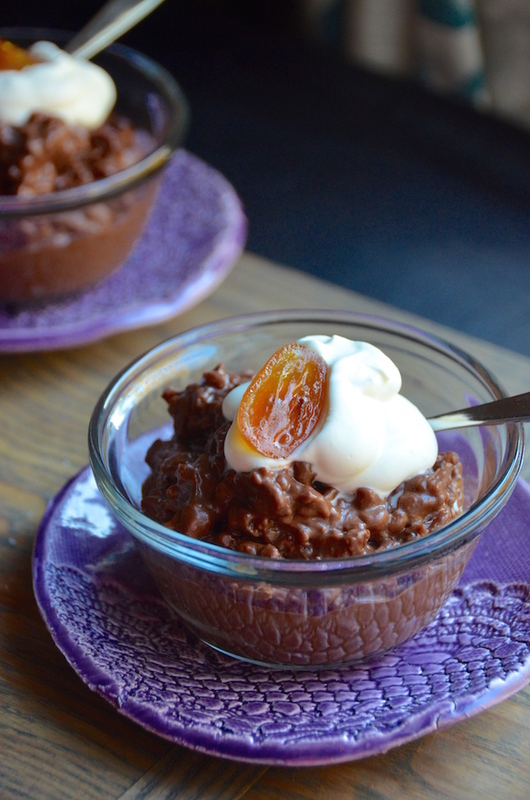 I've had a thing for rice pudding lately. Maybe it's the chilly nights or the earlier sunsets that have me craving a bit of extra comfort. Whatever the reason, a creamy bowl of rice pudding served right off the stove is basically the only thing I want. And this chocolate version? Perfection. I remember when I was in college, I went through a season of making rice pudding all the time. (I was having a bit of a crisis regarding my major and making pudding was my preferred way of avoiding having to make any binding life decisions.) The recipe I used then was a super fussy one that involved multiple pots and the oven and active stirring time, which my roommates totally loved. 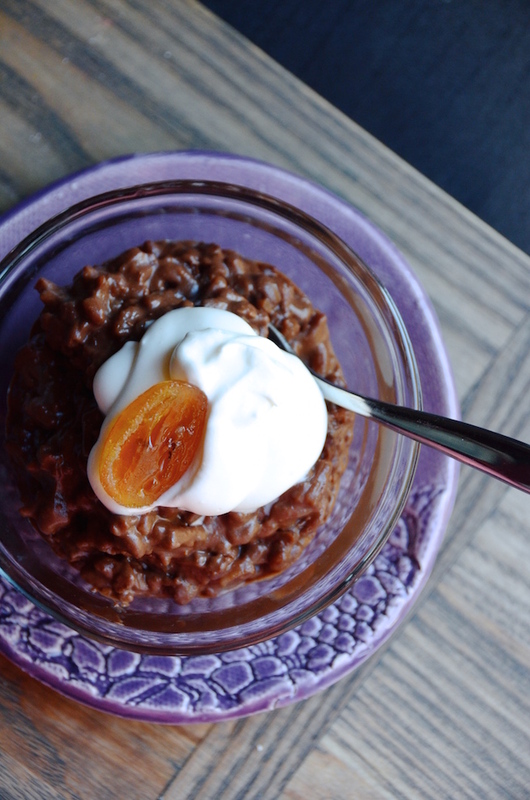 But last winter, while working on my e-cookbook, I started playing around with rice pudding recipes again and realized that, like with most things in life, it doesn't have to be that hard. This easy recipe is rich with both cocoa powder and dark chocolate chips, plus a few cups of coffee to deepen the chocolate flavor. And when I say easy, please note that I really DO mean easy. This recipe contains only three steps: boiling the rice with water, cocoa, and coffee, adding in the milk eggs and sugar, and then letting it simmer. There's minimal stirring, too, because I have no patience for that. Serve hot or cold (your choice) with a big dollop of loosely whipped cream it's a truly lovely thing. 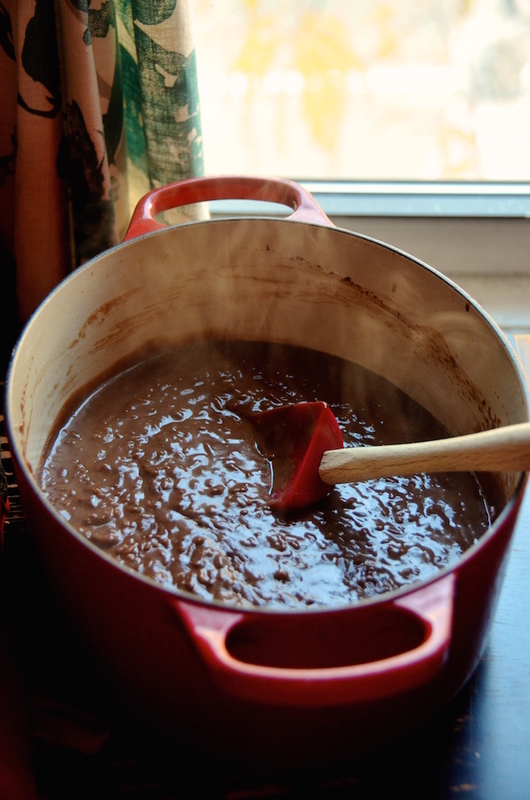 Combine rice, cocoa powder, salt, coffee, and water in a large heavy-bottomed pot. Bring to a boil, then lower heat and let simmer for 10 minutes or until water has mostly evaporated. Remove from heat, stir in the remaining chocolate chips. Serve warm or chilled, as desired.